OCEANSIDE — Thirty-five miles north of downtown San Diego and 83 miles south of Los Angeles sits Oceanside’s small craft harbor — a 950-slip marina that throughout its existence has maintained a small-community atmosphere. With the development of the nation’s largest Marine Corps base next door during World War II, Oceanside went from a sleepy beach town to a modern city during the 1950s. And the development of the city’s recreational harbor in the early 1960s helped transform Oceanside into a tourist and recreational destination. 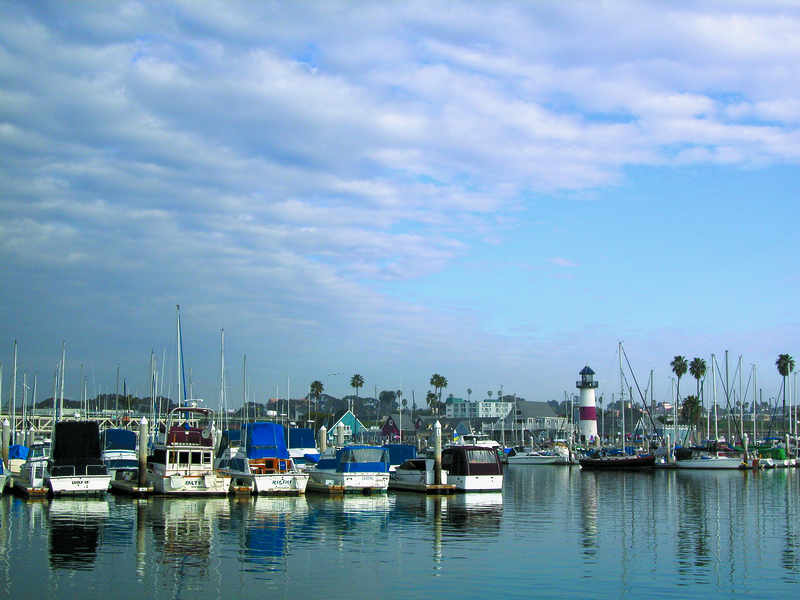 Oceanside Harbor is operated as a public marina, run by the Oceanside Small Craft Harbor District. The harbor has public works officers who work in the harbor and eight police officers who are also trained as boat operators and divers. The harbor features a North and South Basin, and both have the same layouts — with boat docks, restrooms, sidewalks, parking lots and greenbelts. The Harbor and Beaches Department is a division of the Public Works Department, where Quan is a division manager. Besides managing the harbor, Quan — who has worked in the harbor for 32 years — is responsible for the city’s beaches and the municipal pier. Quan said that many of the slip tenants are northern San Diego County and Riverside County residents, who make the trip to Oceanside to use their boats. Slip lengths in the harbor range from 26 to 51 feet, with side-ties available for larger boats up to 100 feet in length. Rental rates are $11.10 to $12.30 per foot, per month, with fees based on hull length or length of slip, whichever is greater. Slips are single, and water and electricity are included dockside. A limited number of liveaboard permits are available in Oceanside Harbor, at an additional charge of $3.30 per foot, per month. There is a waiting list for liveaboard permits. Currently, Quan said, there is a waiting list for all slips in the harbor, due in part to the low rates, convenient ocean access and sturdy docks. The harbor underwent a major dock rebuilding project in 1985, when concrete docks were installed in the harbor by Bellingham Marine. In addition, the Harbor District institutes yearly maintenance replacement projects every winter. This year, the harbor is replacing and renovating the last third of the 50 available guest docks. Included in the upgrade is a new guest pumpout facility. In May, Oceanside City Council members approved a $9.4 million, 20-year Capital Improvement Program for the harbor, which includes new restrooms, riprap repairs and other infrastructure repairs for the next 20 years. All Oceanside docks are gated and locked, for slip tenant access only. With a good mix of power, sail and commercial fishing boats calling Oceanside home, the harbor offers a wide array of services — including restaurants, a launch ramp for trailerable boats, dinghy racks available for rent, a fuel dock and a live bait receiver. For more information on Oceanside Harbor, call (760) 435-4000 or visit oceanside.ca.us.